People I respect support and oppose the Stand for Salmon initiative, Proposition 1 on the November ballot, so I dug in to figure out what the initiative actually does and why the feelings are so strong. As edited by the Alaska Supreme Court last month — it removed the strongest provisions — the initiative won't cripple resource development. It creates a new system for reviewing projects with public involvement and sets standards for deciding how much protection is needed. Reasonable people could disagree on whether the initiative goes too far. There are aspects I disagree with. But the development community's hysteria about it is unjustified. It won't shut down the Alaska economy. I can see why people are anxious, though. The initiative is confusing. Even its sponsors admit making complex environmental law by petition is a bad way to go. They say they were forced to by losing round after round in Juneau. With the repeal of the Coastal Zone Management Program under Gov. Sean Parnell, and the defeat of legislation to update a permitting system outdated by decades, developers can get permits to destroy salmon streams without public input or appeal. It comes down to who happens to be governor. The Alaska Board of Fish — our constitutional fisheries policy body — objected to that state of affairs in a letter to the Legislature in January 2017. The board called for a new law to provide public notice of permits and to create standards for approving them. A bill to do that got started in the Legislature, but after two years didn't make it out of its first committee. Rep. Louise Stutes, R-Kodiak, said her Fisheries Committee ran out of time. Mike Wood, a Talkeetna activist and initiative sponsor, thinks opposition from the Walker administration killed the bill. It's hard for me to understand why two years wouldn't be enough time to mark up a bill, but I have to believe Stutes. It was her bill. The initiative got almost 50,000 Alaska voters' signatures. It would create three types of permits. A general permit would cover everyone involved in a common activity — perhaps allowing stream fords for vehicles in certain spots, for example. For particular activities, the state could give minor permits, covering activities without much impact, and major permits, for projects that would hurt salmon streams. Major permits would say how a developer would address those harms. Developers would have to post bonds to assure the work is done as promised. For any of the permits, the public would get notice and the opportunity to appeal. So far, I don't see much to object to. The real issues come in the standards and the process for major permits. First, which streams does the law apply to? 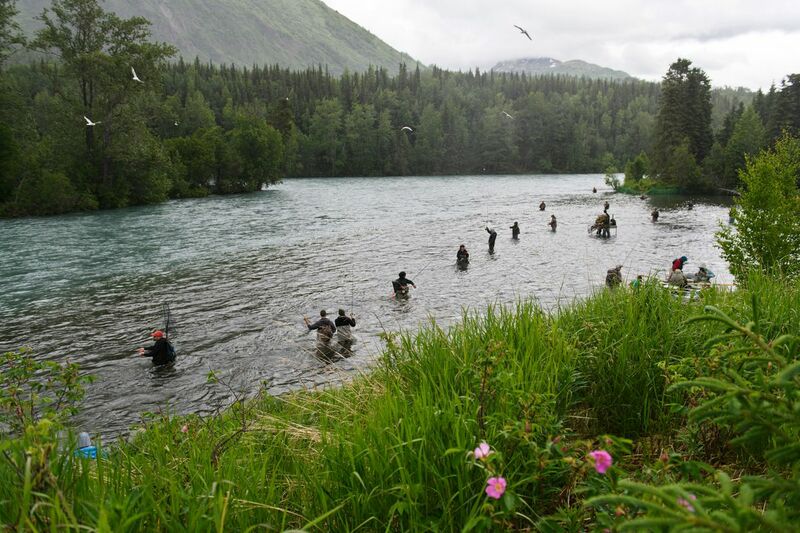 The initiative is only for anadromous waterways — those with fish that migrate from the sea — but the state's surveys of those streams cover only a fraction of Alaska. Each year, biologists for the Department of Fish and Game find more. Environmentalists claim they spent millions of dollars cataloging salmon streams in the area of the proposed Pebble Mine (the Pebble Partnership says it paid more). Environmentalists say developers should be responsible for the cost, not private citizens. Under the initiative, streams are assumed to be anadromous unless a survey says otherwise. Opponents claim that would stop work in every waterway in the state until fish studies are complete. I think that's an exaggeration, but the cost of studying waterways that are obviously sterile is a legitimate concern. Next is the issue of standards. As originally written, the initiative would have prioritized salmon over other uses, taking away the discretion of the state to approve projects such as the Donlin, Pebble or Chuitna mines, which would eliminate portions of salmon-bearing streams. The Alaska Supreme Court ruled that voters can't do that by initiative. The Alaska Constitution gives the Legislature the power to determine how to spend state assets — even if the asset is a stream and is it being "spent" to promote a coal mine. But the court left in place initiative standards that would not block projects outright. Those standards are still more rigorous and detailed than existing law. Are these the right standards? I'm not qualified to say. But developers can't maintain they would stop projects. The court heard those arguments and took out those provisions. But one other aspect of the initiative could make some big mines and dams impossible, the requirement that mitigation of harm for a project may not be on, "another water body, other portions of the same water body, or land." Under the federal permitting system, developers of projects that damage wetlands and waterways can make up for the damage by paying to enhance habitat somewhere else. Sometimes, they just pay into a conservation fund. Mike Woods said the Susitna hydro project would have mitigated destruction of salmon runs by funding a hatchery in Prince William Sound. As a fisherman in the Susitna Valley, he thinks that was wrong, and I agree. But a spokesman for the Donlin project in western Alaska said the mine couldn't meet the on-site mitigation requirement. Thinking of a remote mine in rural Alaska, I can imagine how that would be the case. Besides, the rule isn't good policy. Brad Meiklejohn, of the Conservation Fund, a mitigation expert, said the system works better with flexible funding, addressing other areas in the same watershed as a development, not only on-site. Despite the flaws, I will vote for the initiative. Besides improving permitting, the vote would make a statement of values for Alaskans who love, revere and want to protect salmon. Development advocates have called the shots in state government for a long time. State decision-makers have lost credibility with many conservation-minded Alaskans. Exaggeration by those who oppose the salmon initiative further erodes that trust.